The Isaac’s Way Summer Art Auction #27 in Fredericton, New Brunswick has ended! And my painting ‘morning sky’ has sold for the full price of $260. I am so pleased since the charity is to provide for MUSIC lessons for kids-in-need. My painting in the next Art Auction (runs September 25 to late January, 2017) is perfect for fall. It is entitled ‘blueberry red’ and depicts a blueberry field near Stewarton, New Brunswick in late autumn when the blueberry leaves turn a brilliant red. The painting is 24″ wide by 20″ high, acrylic with gallery edges. I am donating 50% of the proceeds from my painting to the charity. I hope you like it! I have submitted another painting to Isaac’s Way Restaurant, for their 24th Art Auction and Sale. This event will run from May 24, 2015 to September 20, 2015. The proceeds from the auction go to sponsor kids-in-need for theatre lessons. Looking for a theme for my recent work, I decided to do a series of still life paintings about the many elements of the out-of-doors we bring into our homes. This includes items collected on walks, motifs on fabrics and metals, small statuary and so on. My second painting in the series is ‘Outside-In No. 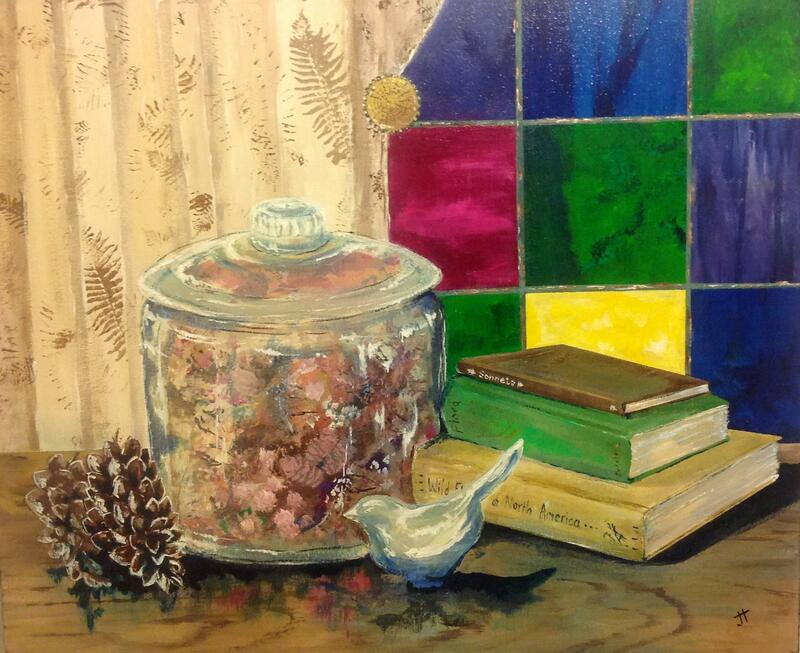 2’ – a still life of books, a jar of potpourri, a metal bird sculpture, pine cones and my fern curtains. For the painting, I used Chromium Oxide Green, Burnt Umber, Titanium White, Phthalo Blue, Cadmium Yellow and Quinacridone Magenta. I finished some surfaces in the painting with Golden Polymer Medium (Gloss) to give some items shine and a smooth texture. The canvas for my next painting stands ready on the easel. Now, to look around the house for some out-of-doors items to include in the painting! At the end of January, 2015, I published a post about the 23rd Art Auction now being held at Isaac’s Way Restaurant in Fredericton, New Brunswick ( https://nichepoetryandprose.wordpress.com/2015/01/26/art-auction/ ). Isaac’s Way organizes three auctions each year, each raising funds for children’s charities in one of four artistic areas: dance, art, music, and theatre. The art is sold by silent auction to raise funds for kids-in-need. Since 2007, the auction has raised more than $92,200 ! My painting for this auction, entitled ‘blue stone’, has sold. I now have another painting to replace ‘blue stone’ in the auction. The painting ‘outside-in’ was fun to do. The outside has been brought inside in many ways – the mosses in the terrarium, the wood of the table, the vines, the fern pattern on the curtains. 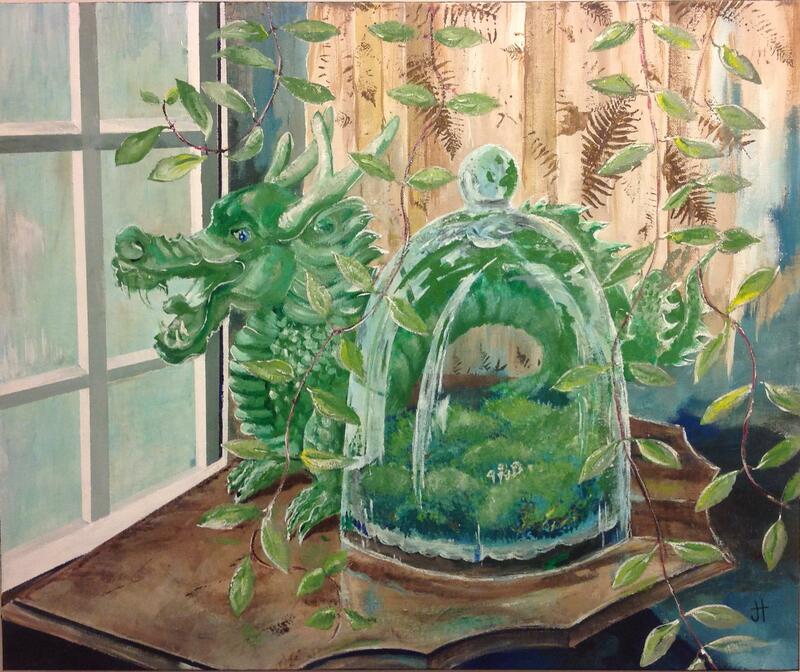 And yet, the dragon turns to gaze out the window (sometimes his eye looks at ‘you’). I used four main colours – Chromium Oxide Green, Burnt Umber, Titanium White and Phthalo Blue – and touches of Phthalo Green, Cadmium Yellow and Quinacridone Magenta. To give shine to all the glass and wood in the painting, I used several layers of a tinted glaze. The more than 60 art pieces on display at Isaac’s Way will be for sale until May 24, 2015 ( http://isaacsway.ca/art/ ). This auction will sponsor MUSIC lessons for kids. Issac’s Way also has, for auction and sale, paintings created live during Fredericton’s recent winter festival, Winterfesthiver ( if you are on Facebook, just look for Winterfest Art Auction 2015 ). I am so proud to take part in this worthwhile project.